For the fourth year, the U.S. Clean Energy Education & Empowerment (C3E) initiative has recognized the outstanding leadership and extraordinary achievements of mid-career women working to advance clean energy. The MIT Energy Initiative (MITEI) administers the C3E Awards in collaboration with the U.S. Department of Energy (DOE). 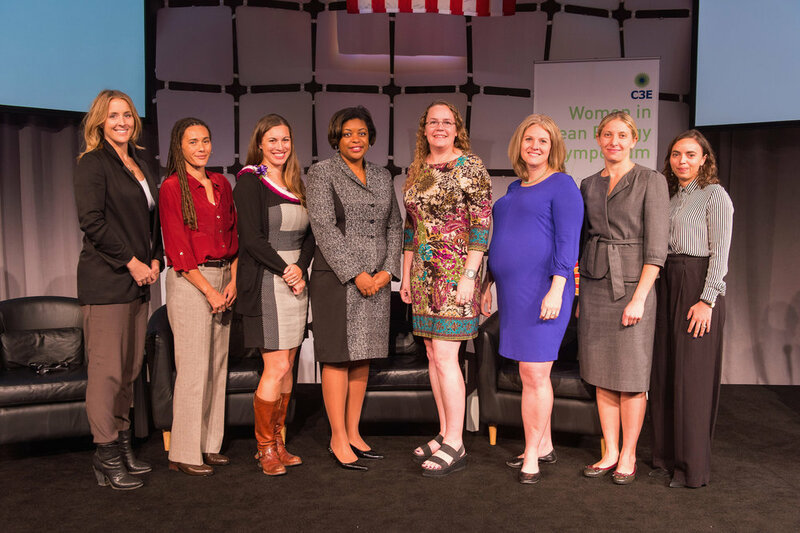 The winners received their awards during the annual C3E Women in Clean Energy Symposium, held November 4 and 5 at MIT. Nine remarkable women were honored this year: eight mid-career women received awards for leadership in specific areas and Mary Nichols, chair of the California Air Resources Board received a lifetime achievement award for her career of public service and regulatory breakthroughs that have advanced clean energy and environmental protection. The winners were nominated across multiple categories and were selected by the U.S. C3E Ambassadors. International Leadership: Anya Cherneff, executive director of Empower Generation. Cherneff co-founded and leads Empower Generation, a social enterprise that empowers women to distribute clean energy solutions in their remote communities of Nepal. Empower Generation has launched 15 women-led solar businesses that collectively employ over 200 sales agents. To date, Cherneff and her team have distributed 50,000 solar products, bringing clean, safe power and light to more than 250,000 people. In addition, she speaks at global energy companies and women-in-energy networks, continuing to inspire women in the clean energy revolution. Research Leadership: Jessica Granderson, deputy of Research Programs at Lawrence Berkeley National Laboratory. Granderson leads a team conducting cutting-edge research in building controls, automation, and analytics to develop innovative solutions for commercial buildings. She provides technical expertise and knowledge transfer to advance the energy management initiatives of the nation’s largest enterprises, national accounts, and public sector entities. Her methodologies help streamline verification of performance-based savings, and she is a dedicated mentor to students and junior staff, particularly those from groups underrepresented in engineering and science. Education Leadership: DaNel Hogan, director of The STEMAZing Project in the Office of the Pima County School Superintendent (Tucson, AZ). Hogan provides professional development opportunities to Pre-K–12th grade educators, edits The STEMAZing Newsletter, and co-organizes professional development workshops for STEM educators on topics such as energy and water. Previously, she served as an Albert Einstein Distinguished Educator Fellow at the U.S. Department of Energy, where she led outreach on the Energy Literacy Framework, an effort involving 13 federal agencies and thousands of experts. She continues to serve on the Teacher Advisory Board for the National Energy Education Development Project. Advocacy Leadership: Dawn Lippert, co-founder and director of Energy Excelerator. Lippert is the Founder and Director of Energy Excelerator, a startup program dedicated to helping solve the world’s energy challenges, starting in Hawaii. She has raised over $40M to help companies reach the market and achieve scale through targeted funding and strategic relationships with customers, investors, and corporate partners. The non-profit program has funded 43 companies thus far. Lippert also is Chair of the Board for the Hawaii Clean Energy Initiative, a board of private and public energy stakeholders tasked with transforming Hawaii to 100% renewable energy. Entrepreneurial Leadership: Erica Mackey, co-founder and chief operations officer of Off Grid Electric Ltd. Mackey leads the world’s first massively scalable, off-grid electric company, which delivers reliable, affordable energy to African communities. Using an innovative, pre-paid solar model, the company will have provided over 100,000 African homes with clean, modern electricity by the end of 2015. Mackey also launched M-POWER Academy to train young East African professionals and place them in solar jobs. She was recognized as a Forbes “30 Under 30” for her leadership, won an Ashden Award for Financial Innovation, and is an alumna of the International Achievement Summit. Business Leadership: Grace Overlander, manager of New Product Introduction for Tesla Motors. Overlander is responsible for the successful launch of more than a dozen distinct products across over 12 production lines at Tesla Motors. Her team launched new battery and electrics components that are at the heart of the Model X sport utility vehicle, and she was responsible for the introduction of Tesla Energy, which is revolutionizing the home and industrial energy storage markets. She is active in educating students and coworkers, sponsoring internships, and championing executive events to introduce students to electric vehicle technology. Government Leadership: Carla Peterman, commissioner of the California Public Utilities Commission. Carla Peterman led the CPUC’s adoption of an energy storage procurement framework and the first mandatory U.S. utility program for purchasing energy storage. Her work is accelerating investment in storage across the United States. She oversees CPUC’s $1 billion-plus annual customer-funded energy efficiency program, leads implementation of California’s 50% Renewable Portfolio Standard, and runs the CPUC alternative vehicle program, which aims to put 1.5 million zero-emission vehicles on the road by 2025. She is a former Commissioner of the California Energy Commission. Law and Finance Leadership: Alina Zagaytova, assistant general counsel for First Solar. Zagaytova leads the company’s strategic partnerships and investments, project finance, mergers and acquisitions, and distributed generation programs. She has handled over $10 billion in financing and transactions for renewable energy projects and led First Solar’s energy access projects in Africa and South America. Zagaytova provided pro bono legal help to several clean energy start-ups that are now thriving companies and serves as a mentor to junior staff within her organization. She also founded a networking group for young renewable energy professionals in Washington, D.C. Lifetime Achievement Award: Mary Nichols, chairman of the California Air Resources Board (ARB), has devoted her entire career in public and nonprofit service to advocating for the environment and public health. She has served in her current role since 2007, and previously held the post from 1979 to 1983. At ARB, she implements California’s landmark greenhouse gas emissions legislation and sets air pollution standards for motor vehicles, fuels, and consumer products. She has previously served as California’s Secretary for Natural Resources and as the head of the Office of Air and Radiation at the U.S. Environmental Protection Agency. This year, the selection committee also awarded a special commendation to Kathryn Swartz, executive director of Solar Energy International, for serving veterans. Swartz has implemented the U.S. DOE’s Solar Ready Vets training programs at nine military bases. The training provides transitioning service members with the technical expertise they need to start careers in the renewable energy field. More extensive profiles of each awardee are available at c3eawards.org. Nominations for the 2016 C3E Awards are now open. Sponsors of the 2015 C3E Symposium are: Brattle Group, Cummins, Florida Power and Light (FP&L), GE, Hawaiian Electric Industries, Hogan Lovells, Lockheed Martin, MassCEC, Sabanci Holdings Enerjisa and Industry Group, Shell, SolarCity, Southern CA Edison, The Alliance for Sustainable Energy, and Walmart.